Marketing budgets have been revised up at their highest rate since 2007, according to the latest IPA Bellwether Report, giving brands and agencies cause for optimism. Companies are also more confident about their prospects. The survey found that advertisers are the most upbeat they have been since the third quarter of 2009. Of the survey panel, 43 per cent had grown more confident, while 16 per cent had become more pessimistic. 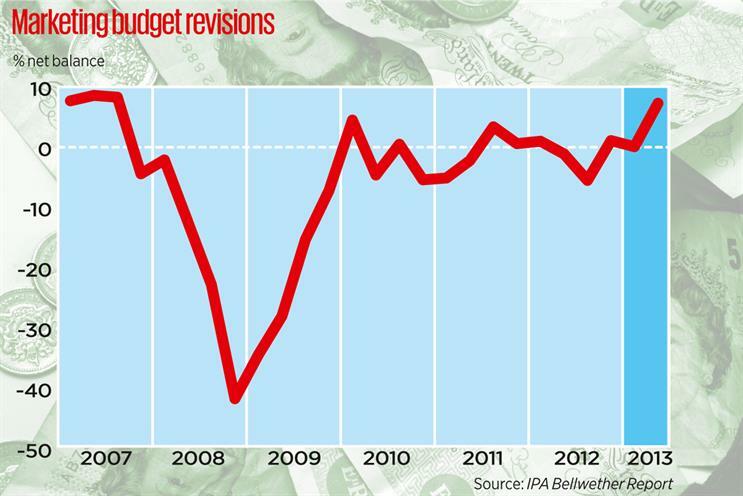 Budgets were revised sharply upwards in the period between April and June. The net balance of 7.3 per cent is the highest recorded since the third quarter of 2007, just before the recession began. Nearly a quarter of marketers surveyed (22 per cent) had revised their marketing budgets upwards, while just 15 per cent said they were planning to cut spend. More than 13 per cent of companies are planning a net increase in marketing budgets this year – the most positive forecast for two years. The findings will fuel hopes that the prolonged period of cuts since the beginning of the financial crisis will come to an end this year, amid rising optimism about the economy, improved weather and sporting successes. Paul Bainsfair, the director-general of the IPA, said the report was "extremely encouraging". Bainsfair added: "Things are on the move, and that’s what we’ve been waiting for for a long while. We’ve known for some time that many big corporates are sitting on a lot of cash. It’s inevitable that they will start spending again because, in the long run, they are all defending their positions in the market or trying to increase their brand share." As in previous Bellwether findings, online spend is the key factor behind the budget growth, with a net balance of 17.4 per cent – a pronounced improvement on last quarter’s 8.9 per cent. 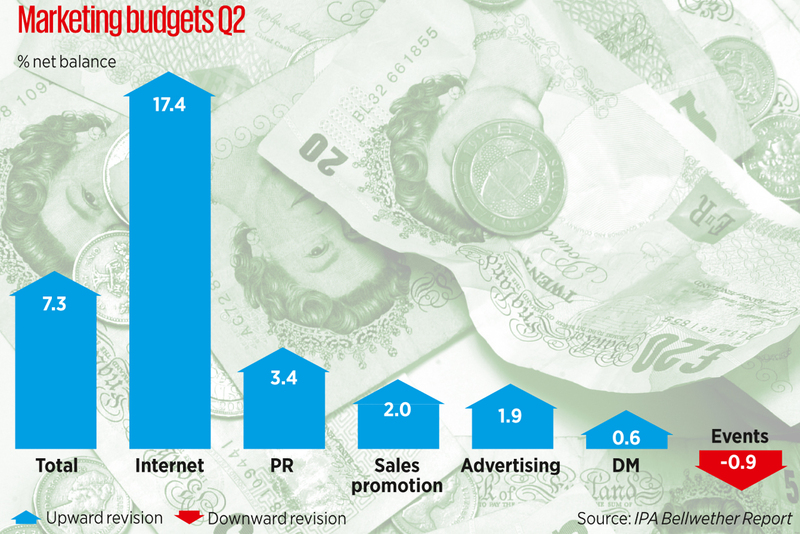 PR budgets were revised up 3.4 per cent, with sales promotion and main advertising rising 2 per cent and 1.9 per cent respectively. BT and Sky were big spenders in the last quarter, both battling for customers ahead of the launch of BT Sport, the rival service to Sky Sports. The electronics and technology sector has also seen a boost in spend, with brands such as Sony, Apple and Google vying for position. Sources suggest car brands have increased spend during the summer, with more growth expected in August. The same is said of traditional FMCG brands, such as those owned by Procter & Gamble and Unilever. Jane Ratcliffe, the chairman of MediaCom UK and a member of the IPA Media Futures Group, said: "I think you’ll see the FMCG market come out strong, because the competitive marketplace is really tight. "The likes of P&G and Unilever traditionally spend during a recession, but even their spend has been tailored back over the last four or five years." The Bellwether findings reflect the accelerated growth expected in the UK economy this year. The International Monetary Fund revised its 2013 forecast for the UK on Tuesday and now predicts a 0.9 per cent increase, up from 0.6 per cent.